At Earth Tones Studio, John teaches workshops on how to make drums as well as percussion instruments, including found materials such as durable PVC plumbing pipe. He facilitates drumming circles and soundscapes for people of all ages who respond to the call and the dance of the drumbeat. His passion is building traditional world drums including the African Djembe, Taiko drums made from PVC, Ashiko and Frame drums as well as drums and percussion instruments crafted from Hard Shelled Gourds. He is creative and artistic and is always coming up with new junk percussion ideas for fun and entertainment. He also sells the drums that he makes. 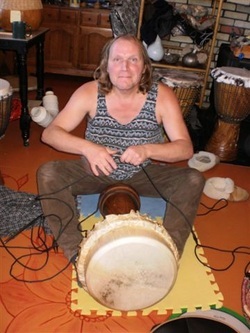 John is also a certified Roots of Rhythm teacher and he provides an innovative cross-curricular program that offers training to both teachers and students in fundamental rhythms both ancient and modern. Roots of Rhythm: K-12 Teacher Training is offered in a 5 day format. For complete information about the ROR curriculum, please go to the website www.rootsofrhythm.net.